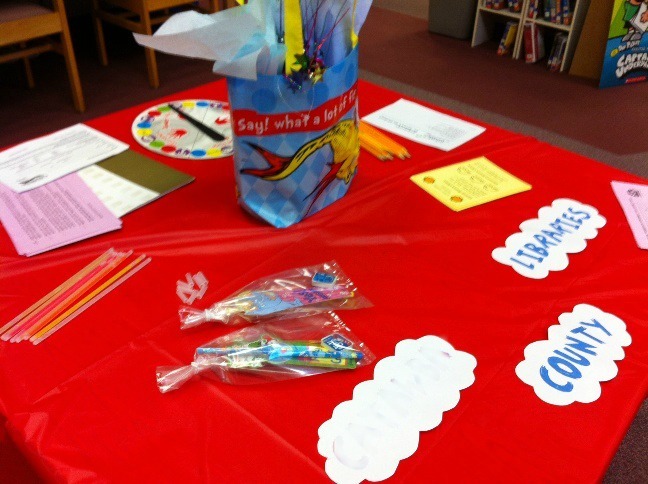 Last week, I was going to play host to two kindergarten classes coming to the library to celebrate Dr. Seuss’s birthday. Since we had inclement weather, the event was moved to this week. It was so much fun! 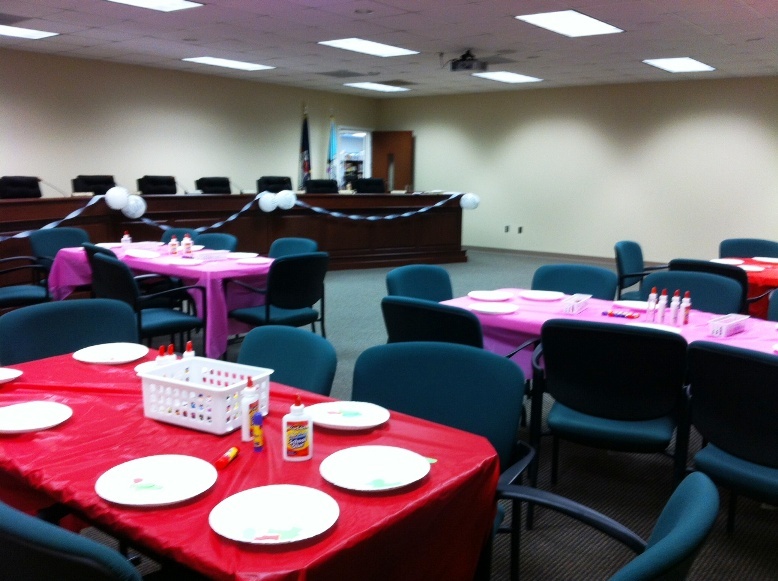 I work between two branches, and for the branch the kiddos were visiting, the easiest event space for a group that size is made through converting the city’s council chambers. They graciously let us use it so long as we put everything back immediately and coordinate dates with them. 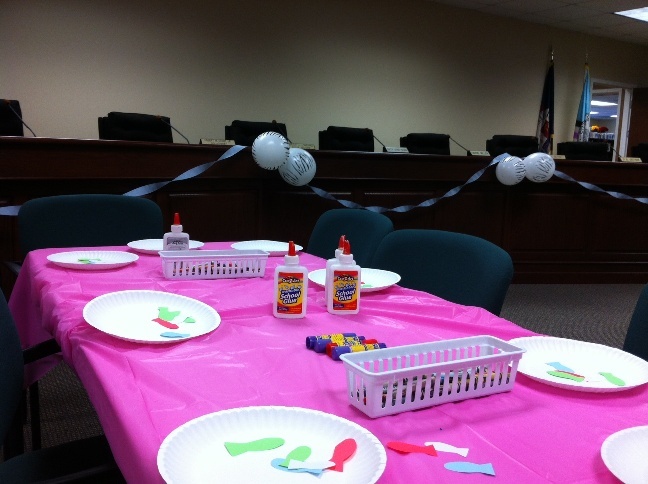 Council chambers are kind of mysterious and fun for kids, but I also dressed up the room for their arrival. 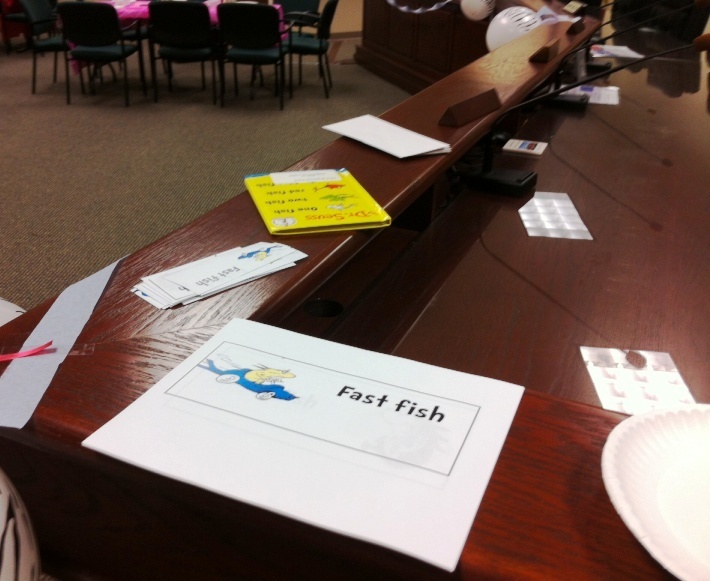 I had four tables prepped with crafts–plates and fish to transform into their own fishbowls. Since there was little time between the groups, I made a stack of plates with fish all ready and then just put them on the table when the first group left. A couple things happened that threw off the plan slightly. One, I left my projector cable that would have allowed me to project videos for music and dancing. I didn’t prepare by having cds as well, but I just decided we could sing and play action games. I also realized we weren’t going to have time for me to pass out snacks to everyone, so I just sent snacks back with the kids to have in their classrooms. Kids got a tour of the library on the way in. 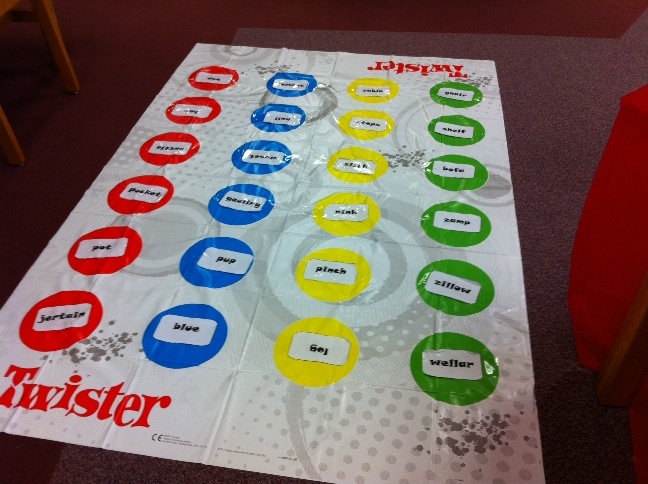 Sing/play: Open, Shut Them three times–first slowly and then faster and faster. I always talk about listening with every crowd, even kids with teachers there to help. I always ask, “how do you know when someone is really listening to you?” And they think and we talk about how we like someone to look at us when we’re talking to them and they should listen quietly, without talking. I go over this again and again with preschoolers, who always have to think long and hard despite the repetition. It’s a good way to point out positive social behaviors, in my mind. Play/talk: Opposite game with the cards pictured above. I handed out cards with fish from the book. There were enough so that two or three kids would have the same card, so when I called for all the “fast fish,” a small group would stand and act out being fast. Then I’d ask for the opposite and the slow fish would hold up their cards and act slow. This went back and forth for ten different fish, all the opposite of each other. On the way out, most of the kids told me how much they want to come back with their mom and dad. I hope and hope and hope that they do!